When Chelsy and Darien announced their intimate wedding ceremony and reception for a Tuesday in June, their friend Jade stepped in to help organize the bridal party's flowers and I was happy to help. Instruction was minimal, but Jade knew Chelsy liked eggplant purple so I ran with that and created some simple bouquets and boutonnieres for the whole group. A few weeks ago I hosted a class at the beautiful Work/Shop on how to make your own hanging kokedama. Kokedama is the art of wrapping a plant's root in moss to bring the expensive and time-consuming art of bonsai into the home. It's a simple and fun project that can transform a space in your home or office that may be too small for big potted plants. I love how, whenever you're working on any kind of floral or plant project, even if everyone's materials and instructions are the same you all come out with something uniquely personal and this day was no exception. Each student picked her own plants - some ended up with hanging kokedama and some took their moss balls home to rest on plates or in bowls on their windowsills. They were all different and beautiful. For the full DIY, visit my guest post over on Clementine Daily. To learn in person, come join me as I host this class again at Work/Shop later this month! NOTE: This DIY was also featured in Camille Styles Weekend Notes! A couple of weeks ago I was asked to host a holiday wreath workshop and couldn't have been more excited to say yes. Lorien Steele designed a beautiful invitation for us and away we went with planning and prepping and making. Seven super fun ladies signed up and I think the finished products turned out beautifully. It's so fun, even as the instructor, to learn along with other creative people... thanks to everyone who attended! Let me know if you'd like to host a workshop for your office-mates, friends or family. Lots of floral craft ideas to take us through the new year and beyond! So excited to be able to share the final photos from this summer's modern flower child wedding inspiration shoot! We've been featured on the beautiful Burnett's Boards and I'm exploding with pride! This was such a fun afternoon! Last month I had an opportunity to work with photographer Mylyn Wood on a beautiful 1960s inspired wedding shoot. Mylyn gave me some direction - lush, orange, mid-century - and then she let me take it from there. What a dream! 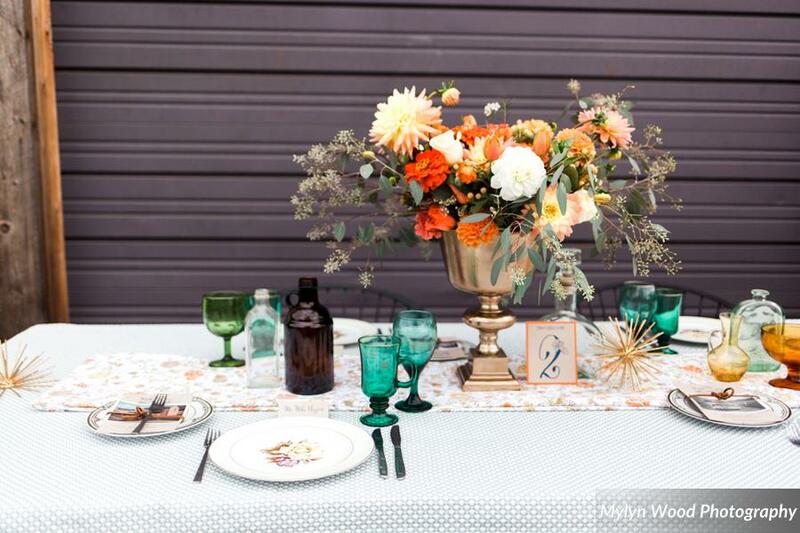 Mylyn's styling really showed off the florals and I can't wait for you to see her photographs. For now, here are a few of my iPhone captures to give you a taste.